I sure hope you are doing better – I think of you often!! And it takes the World Series for me to finally get around to letting you know! I don’t know if you are a sports fan, or follow baseball at all. Having been born and raised in Massachusetts, I am a huge Red Sox fan. I used to keep baseball scrapbooks as a pre-teen, and the 1975 World Series (Red Sox vs. Reds) was something I followed minute by minute. (Yes, I really am that old – I was 12 that year). Anyway, I’ve lived and breathed the heartache caused by the Red Sox my entire life — until 2004 of course, when we finally, deliciously, won it all! Which brings me to THIS year! We’re in it again, and playing what I have to assume is YOUR team! It’s exciting to play the team of friends. I must confess to not knowing much about the Rockies – I’m certainly an AL girl with a strong East Coast bias. But I understand this year’s Rockies team is pretty special, and is on one heck of a roll! I’m watching Game 1 as I type this, and while of course I hope the Red Sox win this one tonight, as well as the next 3 (or at least win 4 before the Rockies do! ), I wanted to say hey, and wish your team a great series as well. Hope you, Brett and each and every kid is doing great – our love to you all! Why can’t we play outside? I’m playing along — see Jennifer for more info on this! I am a huge sports fan. A New England sports fan. Baseball and football specifically, which means the Boston Red Sox and the New England Patriots. As I type this, the Red Sox are in the top of the 4th inning of Game 2 of the ALCS against the Cleveland Indians. I love the Indians for the trouncing they just gave our most notrious rivals, the New York Yankees. And in fact, they have some tremendous players on their current roster: Kenny Lofton and C.C. Sabathia come to mind immediately. Of course, I hope we give them a similar trouncing on our way to the World Series, but that is all still to be seen. But what really bothers me is the Indians team logo. 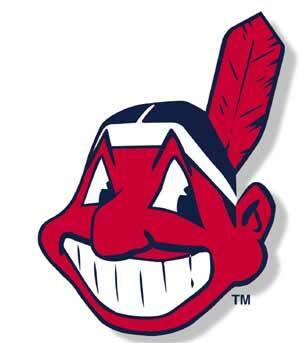 I’ve only just learned its name: Chief Wahoo, which seems to add insult. This symbol is hugely offensive to me. It is a racist charicature. I can’t understand why this symbol is still being used in the year 2007. People claim tradition, they claim it’s all in fun, that it’s just a cartoon, not worth making a big deal of. Are we still permitting the ridicule of ethnic minorities in the name of fun? I didn’t know the history of the name Indians. I’m only one person, but I think the history supports the name. The reasoning behind the name is honorable, and was done with respect. But the symbol/mascot insignia has got to go. Native Americans do not have beet red faces, wear feathers, have huge teeth and shifty eyes. They are not a warring people. I’m hardly the first person to make this comparison, but if we ever had a team called the Worcester Whities, the Atlantic City Jews, Springfield Jigaboos or the Hoboken Crackers, no doubt people would be lining up to sign petitions to get the names and whatever offensive mascot went along with it. Don’t all people deserve the common courtesy to not be made fun of for the core of who they are? Or at least, I hope so!! My pledge to post regularly sure didn’t work out so well, did it. Well, I just signed up for NaBloPoMo, which means I’ve committed to posting everyday in the month of November. Can I do it? Well, we’ll see! The site suggests that if you have trouble coming up with something new to write about everyday that you think about posting on a theme. So I’ll have to think on that. Parenting – Adoption – Race – Sports – TV – those are my general interests that I think could be food for thought. I have a three weeks to come up with what I’m going to do.